An accountancy partnership wishing to practice accountancy in California is required to be approved for licensure by the California Board of Accountancy (CBA) before practicing or holding out to the public as an accountancy partnership. An accountancy partnership must have at least two partners, with at least one of the partners licensed to practice accountancy in the State of California. An accountancy partnership with a non-licensee owner must have at least one partner with an active California CPA license. If you have any questions after reviewing the information provided here, you may contact the CBA's Initial Licensing Unit by telephone at (916) 561- 4301 or by email at firminfo@cba.ca.gov. The name of the firm must meet the requirements set forth in sections 5060 and 5073 of the Business and Professions Code (BPC) and section 75.5 of Title 16 of the California Code of Regulations (CCR). CBA staff is unable to provide guidance regarding firm structure and whether a particular firm name will be considered false and misleading by your clients, therefore, licensees are encouraged to contact their legal counsel for guidance. Each time your partnership has a change in partners, address, or telephone number you must notify the CBA within 30 days of the change. The notification must be provided in writing and signed. Each time your partnership has a name change, you must submit a General Partnership/Limited Liability Partnership Name Change Application. Prior approval by the Board is required before you can hold out or practice under an amended name style. The name change application fee is $150. Check, money order, or cashier's check must accompany the application and be made payable to the California Board of Accountancy. All forms related to the name change process are available on the Licensees webpage. General partnerships wanting to change to a Limited Liability Partnership (LLP) may contact the California Secretary of State at www.sos.ca.gov. To dissolve a general partnership, submit a letter to the CBA stating that the firm has been dissolved, and provide the effective date. Upon receipt of the letter, the firm's license will be cancelled. To dissolve a limited liability partnership, you must contact the Secretary of State and file a Notice of Change of Status. The firm must receive a Tax Clearance Certificate from the Franchise Tax Board before the Notice of Change of Status can be filed. 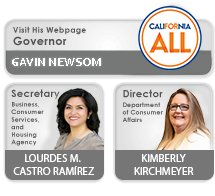 Information on dissolving a limited liability partnership is available on the California Secretary of State's website at www.sos.ca.gov. Information on obtaining the Tax Clearance Certificate is available on the Franchise Tax Board's website at www.ftp.ca.gov. Upon completion of the above, submit a letter to the CBA stating the firm has been dissolved, and provide the effective date. Upon receipt of the letter, the firm's license will be cancelled. Disclosure of the firm's Federal Employer Identification Number (FEIN) is mandatory. BPC section 30 and Public Law 94-455 (42 USCA 405 (c)(2)(C)) authorizes collection of your FEIN. The FEIN will be used exclusively for tax enforcement purposes, for purposes of compliance with any judgment or order for family support in accordance with section 17520 of the Family Code, or for verification of licensure by a licensing entity which utilizes a national examination and where licensure is reciprocal with the requesting state. In addition, BPC section 30 prohibits the renewal of a license by a licensing board if the firm fails to disclose or provide their FEIN. California law does not provide any exception, nor does it permit the CBA to make any exceptions. The application and initial license fees are $270. Check, money order, or cashier's check must accompany your application and be made payable to the California Board of Accountancy. BPC section 5079 permits minority ownership of a public accounting firm by individuals who are not licensed CPAs or PAs. The number of licensed partners as owners must be greater than the number of unlicensed persons. The only exception is that a firm with two owners may have one owner who is a non-licensee. At initial licensure, as well as at renewal, CCR, Title 16, section 51 requires firms with non-licensee owners to certify that his or her principal place of business in California has been informed of the rules of professional conduct applicable to accountancy firms. The declaration must be signed by a licensed partner of the firm. An out-of-state CPA or PA wanting to practice in California must file an application for licensure and meet the requirements set forth in BPC sections 5087 and 5088 and CCR, Title 16, section 21. BPC section 5072(b)(2) requires each partner personally engaged in the practice of public accountancy as defined by BPC section 5051 to hold a valid permit to practice in California or have applied for a certificate as a CPA in good standing of some state, except as permitted by BPC section 5079. The CBA must be notified within 30 days after the admission to, or withdrawal of, a partner from any partnership registered with the CBA. BPC section 5073(e) provides that a registration granted in reliance upon BPC sections 5087 and 5088 may be terminated based upon related changes. BPC section 5072 (b)(1) requires at least one general partner to hold a valid license to practice as a CPA, PA, or accountancy corporation, or be an applicant for a certificate as a CPA under BPC sections 5087 and 5088. BPC section 5072(b)(3) requires each partner not personally engaged in the practice of public accountancy within California to be a CPA in good standing of some state, except as permitted by BPC section 5079. A partnership license must be renewed every two years to remain in good standing. The expiration date is based on the month and year the application was originally approved. If approved in an even-numbered year, the license will expire each even-numbered year on the last day of the month in which it was originally approved. If approved in an odd-numbered year, the license will expire each odd-numbered year on the last day of the month in which it was originally approved. Failure to renew within five years of expiration will result in cancellation of a partnership's license. A cancelled license cannot be renewed, reinstated, or restored. If a partnership license has been cancelled, the partners must reapply and be approved for licensure before practicing or holding out to the public as an accountancy partnership. BPC section 5072(b)(4) requires each resident manager in charge of an office of the firm in California to be a licensee in good standing in California, or to have applied for a certificate as a CPA under BPC sections 5087 and 5088. BPC section 5078 requires in each office of a CPA/PA in California, which is not under the personal management of that accountant, that the work be supervised by a CPA or PA.